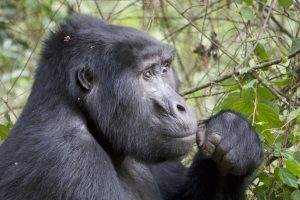 With so many of our clients interested in gorilla treking, we thought you would enjoy this first hand account of written by one of our valued repeat clients, Stacy Dalton, who writes a blog of her own called Grape Finds, offering recommendations, education and observations on wines from all over the world. Well worth the read! I was one of those people profoundly touched by “Gorillas in the Mist” years ago when it came out as I’d been fascinated with gorillas since childhood. Seeing them in their natural habitat was a long-time dream of mine that finally got realized last month thanks to a great surprise trip from my husband in concert with award-winning safari company African Portfolio. As high as my expectations were, the actual experience surpassed them all. Flying over the lush, green-forested expanse leading into Bwindi Impenetrable National Park in Uganda, it was hard to believe I was so close to the home of these magnificent creatures. Mountain gorillas are still critically endangered with only 800 left in the world, all residing in the neighboring regions of Congo (not recommended for tourists at this time), Rwanda, and Uganda’s Bwindi (pronounced by locals as just “Windy”). 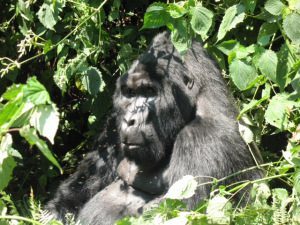 We chose Uganda for economical reasons (gorilla permits are 1/3 the price of Rwanda) and adventurous ones as there is much more to do in Uganda and it’s a bit more off-the-beaten path. 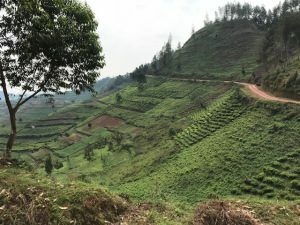 I had no expectations about Uganda as I knew little about it so I was instantly mesmerized by its beauty; majestic slopes, sweeping coffee and tea farms, endless swaths of green, and some of the most industrious people I’ve encountered. Life is very hard there yet it’s set in against an enchanting backdrop of natural beauty and fantastic agriculture with even the red soils adding to the idyllic scene. It is there, in the southwest corner of Uganda, that Bwindi lies and where more than half of the remaining mountain gorillas make their home. 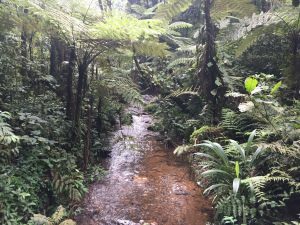 After all, they need to eat 60 pounds of greenery a day so where better to forage for food than a rain forest? That rather ominous word “impenetrable” is not to be understated here. Bwindi is truly a dense labyrinth of a forest complete with trees of all kinds (many with their own type of painful thorn), tangled brush and vines that have become one endless web, and insects that have found their own special heaven swarming about in such droves that there is usually a dull hum in the background. Finding the gorillas therefore is not an easy trek. High altitude, steep vertical climbs on loose rocks, mud slides, and wet tree roots all combined to make this one tough go. I’m embarrassed and grateful to say that at one point I had one porter pulling me in front and one shoving me in back to get me up some of this trek. However, all is forgotten when the gorillas suddenly materialize. It was magical to see the gorillas going about their natural activities. We saw one of the largest silver-backs (males) in the Park from about 6 feet away pulling leaves off a tree and eating in a constant stream. We saw babies swinging through the trees in carefree abandon, a mother digging in a tree hole for ants (apparently a rare protein for them that they love to find when available), and another male deciding if we were threatening him and his family or not. Mostly, I reveled in their penetrating brown-orange eyes, thick black coats, and incredibly similar human features and habits. Just to be so near them in their own world was an indescribable delight. While we could have gladly sat there all day, humans are permitted only one hour with the gorillas once they are located in order to preserve their natural habits and limit their exposure to us. Once back at our lodge, the fantastic Sanctuary Gorilla Forest Camp, everyone was excitedly sharing their day’s stories. This particular lodge is located within the boundaries of Bwindi which makes for very accessible starting points for the Buhoma treks. 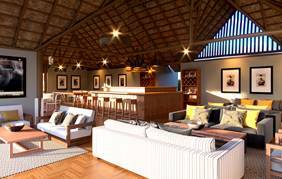 There are only 8 cottages at the lodge which makes for an intimate and congenial atmosphere among all the guests. The common area is one of those tranquil places one could sit all day and just look at the view, surrounded by a stillness rarely experienced in today’s world, the heady smells of untouched land, and the pronounced calls of a wide variety of unusual birds including the Blue Turaco. The gorgeous scenery is only matched by the smiles of the incredible staff at Sanctuary Gorilla Forest Camp. Their attention to every possible detail, continual but un-intrusive follow-up, and absolute sincerity and commitment in their service was unmatched anywhere else we went (or most anywhere in the world I have been period). It is a lovely place that I wish I’d had a lot more time to just “be” there.